One of the things I appreciate most in cinema is when someone takes an genre story and strips it bare, right back to a basic character piece. It doesn’t happen often, but can be very special. 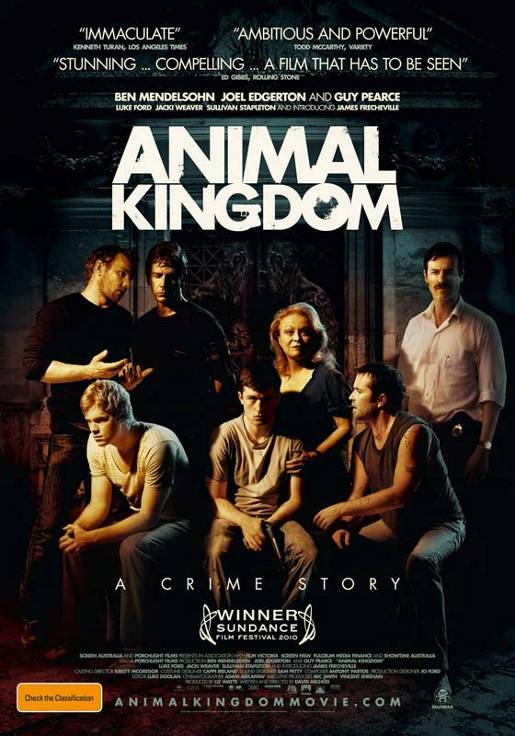 Animal Kingdom at least aspires to this and despite any criticism I may have, it is substantial and memorable. Sadly, I was still largely disappointed. You can’t please some people, eh? I’d be the first to bemoan the state of the Gangster film, a genre that had slipped into self-parody so far that even the best examples of recent years were still predictable and desperate. Animal Kingdom‘s approach is so refreshing that I wanted to like it very much. And up until about halfway, I really did. The story follows J, a docile teenager who has just lost his mother to a heroin overdose. He’s literally numb to the situation and turns to his grandma, who he hasn’t seen for years. She takes him to live with her and her sons, who are all career criminals. He joins the family as they are starting to implode, with too much police attention frustrating them. The most notorious of the brothers, Pope, is in hiding, but he soon returns and that’s when the trouble really starts. So it’s an interesting twist on a dumb, impressionable teenager, surrounded by a hedonistic outlaw lifestyle, leaving him with a choice of glory or normality? Actually it’s better than that. Far more subtle. Nowhere near as much fun either. It would be easy for any potential viewer to read that and second-guess the plot and I’d bet they’d be wrong. You could also try and imagine which stereotypes the characters fit into and you’d still be wrong. Well, “ish”. The plot is very indistinct and the acting naturalistic, largely humourless and quiet (which is a good thing) and some early moments are very powerful. There’s a noticeable and welcome lack of irony, another staple ingredient of the genre. The title as a metaphor for the world J is trying to fit into is about the most obvious thing about the film. There is an incredible early scene where J is persuaded to threaten someone with a gun and he does so, terrified and silent. Of course, he wins the stand-off. He’s the guy with the gun. I wish the film could have built on that, but it seemed to just tread water from then on. Despite that fantastic moment, J remains passive and emotionless (a twist on a typical teen, I suppose!) for almost the entirety of the film and I found it numbing. Also, a lack of plot is one thing, and that really supports the idea of this family who can’t move in any direction, but a couple of developments felt very contrived to force something to happen. Add to this too many attempts to catch the audience out (including the ending, which is so obvious it might as well have been narrated) and suddenly it felt unfocused and disappointingly obvious. That was especially frustrating in a film so fresh as I certainly didn’t expect it to be predictable, if you pardon the expression. While I found J monotonous, that was clearly the intention and James Frecheville is perfectly cast. Only time will prove if that’s a back handed compliment! All the brothers are good with their own personalities, especially Ben Mendelsohn as Pope. I wish he’d had more to do and wasn’t given such a weak last act, but more than once he’s the best thing on screen (see the simmering tension as he watches the ‘All Out of Love’ music video!). If there was any reason at all to watch this film again, it would be for him and Jacki Weaver as Janine, the mother. Hers is the most well written and satisfying role, which you might assume is similar to Billie Whitelaw in The Krays, but Weaver’s is a more interesting perspective. Best of all though, despite having the least screen time of the main characters, is Guy Pearce as Leckie, the detective. He really is superb, working the scene for all its potential while seemingly doing nothing. A late moment between him and Weaver is a brilliant one. As a debut, as a film-making achievement, this is a great piece of work from David Michôd. I really enjoyed his balanced approach and I wish it could have been sustained for the full running time, but for me it collapses in the middle quite badly. There’s no rule to say you must like or hate a film absolutely on first viewing, but I wonder if such seemingly fundamental issues can be smoothed over by time? Despite the hugely positive reaction (97% on Rotten Tomatoes? 2010 Sundance winner?) I find I appreciated it more than enjoyed it. It pales significantly against other recent examples of dialled back raw film-making, such as Monsters or especially the wonderful Winter’s Bone. Still, Animal Kingdom is indicative of a thoughtful, measured style of film I hope takes a stronger hold.